You couldn’t ever accuse the team at Stockade of having limited horizons when it comes to adjuncts. In 2017, they’ve released beers with various additions such as maple syrup, juniper, passionfruit, plum, lemongrass and kaffir lime – all the while picking up competition medals and a People’s Choice award in the process. With all of that and a summer release in mind, they were evidently struck by the notion of a coconut lotion. 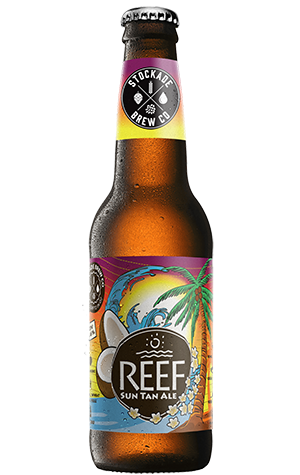 Reef has been tagged a Sun Tan Ale and it channels a kind of nostalgia for tropical islands, palm trees, coconuts and sunscreen, which is no mean feat when you’re attempting to bottle it. To do so, they began with a base golden ale and added Taiheke hops that impart a citrus and lime ting, then threw in some tamarind for good measure. That’s when the star of the show takes over; this beer, above all else, is notable for its use of coconut essence, which adds a decidedly creamy feel and invokes a sensation on the palate equivalent to the feel of lathering oneself with a particular brand of coconut sunscreen. It means the beer doesn’t end up so much as refreshing as intriguing, but, presumably, that was part of the plan.